Kick the ache to the curb, fast. How has Gout-Gone helped others? How do I use Gout-Gone? Ever woken up in the middle of the night with your big toe feeling as though it’s on fire? It feels hot, it’s tender and swollen and you experience pain at the slightest touch? You may be experiencing an acute attack of gout (or gouty arthritis) a form of arthritis that's characterized by sudden, severe attacks of pain, redness and tenderness in joints. Men are more prone to gout. Women become increasingly susceptible to gout after menopause. The signs and symptoms of gout are almost always acute, occurring suddenly (often at night) and without warning. Gout is suspected when a history of repeated attacks of painful arthritis at the base of the toes is reported. Ankles and knees are also commonly involved joints affected by gout. Gout usually attacks one joint at a time, while other arthritis conditions, such as systemic lupus and rheumatoid arthritis, usually attack multiple joints at the same time. Intense joint inflammation occurs when white blood cells engulf the uric acid crystals and release chemicals - causing pain, heat, and redness of the joint tissues. Gout occurs when there is an overload of uric acid in the body. Your body produces uric acid when it breaks down purines, substances that are found naturally in your body, as well as in certain foods, such as organ meats, anchovies, herring, asparagus and mushrooms. The kidneys usually regulate the levels of uric acid in the body, when this process is compromised, gout can occur. A lot can be done to support healthy joints and cartilage in the body. Try to avoid foods that have a higher uric acid content such as sweetbreads, anchovies, sardines, liver, beef kidneys, meat extracts, herring, mackerel, scallops, game meats and gravy. Drink 8 glasses of water a day to help flush out your system and practice systemic detox every few months. Alcohol should also be avoided to keep uric acid levels within a healthy range. Natural remedies can also help to support bones and cartilage and soothe inner membranes – helping to support pain-free joints. In fact, natural remedies have been used in traditional medicine for thousands of years to support the healthy functioning of joints and ligaments as well as tendons. Gout-Gone a 100% natural homeopathic remedy formulated for the relief of gout symptoms, including acute swelling, inflammation and burning pain in small joints, especially the big toe. Gout-Gone can been used to safely maintain joint health and support healthy uric acid levels in the body, without harmful side effects. This remedy contains a selection of homeopathic remedies known for their ability to address discomfort associated with Gout. Due to the concentrated tincture formula, Gout-Gone Drops are absorbed into the system with ease – exactly when you need it! Antimonium crud (6C) - was used in ancient times to treat hoof damage on horses, this homeopathic remedy can help o soothe common achy pain in joints. This remedy suits those that have symptoms that tend to get worse with hot or cold temperature, and improve with rest. Quercus (12C) – useful homeopathic ingredient when addressing maladies that strike and come on very suddenly. Helps to soothe and dissipate common pain in joints. Rhododendron (6C) – this is particularly useful in addressing tearing pain in bones or the inflammation of the great toe-joint. Benzoic ac (6C) – homeopathic remedy useful when pain radiates in the joints of the extremities or joints that crack, with redness and swelling or sharp, tearing pains in the joints of the big toe. Silicea (D6) - is the fundamental ingredient of sandstone, and is also found in human and animal tissue, where it is used to strengthen bones and teeth. Nux vom (6C) – is recommended to help the body detox especially when symptoms worsen with consumption of spicy or acidic food and drink. Ledum (6C) - this remedy can help when an individual feels hot inside, but the affected part is cold to touch and is relieved by cold applications. Gout-Gone contains no gluten, artificial flavours, colours or preservatives. It is suitable for vegetarians and safe for all ages. 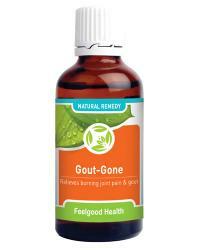 Gout-Gone is presented in a concentrated 50ml tincture formula, making it easy to take. Hold bottle upside down and administer 10 drops directly into the mouth. Alternatively dilute 10 drops in quarter cup water and sip slowly. Dosage may be repeated every 20 - 30 minutes if needed until symptoms subside. May be used with JointEase Plus for ongoing joint support. Gout-Gone supports the body on a cellular level – helping to support pain-free joints - from the first dose. Gout-Gone contains homeopathic ingredients in a tincture formula that facilitates rapid absorption into the system – just when you need it! One bottle of Gout-Gone will last approximately 30 days (depending on frequency of use). Soothe burning gout while healing from the outside! Remedy to assist with memory plus soothe gout pain and burning! Soothe painful gout while detoxing the body of excess acid and toxins! Soothe painful gout while addressing hypertension! Soothe painful gout while fighting free radicals and the aging process! Soothe burning gout while assisting healthy digestion! Address painful gout while soothing stiff and sore joints! No Burn: Soothe symptoms of painful gout while addressing acid reflux!